In episode three of our series Destination Mars, we finally arrive at the Red Planet - but what is waiting for us when we get there? We examine possible solutions to the challenges of building a home on an alien planet, including a Star Trek-inspired health scanner and bacteria that can be engineered to grow rocket fuel. Plus, the science headlines from around the world: a brain scan for epilepsy, the bees that are addicted to caffeine and the science behind hallucinations. Brain scans that pinpoint the source of epileptic fits have been developed. Kate - Epilepsy is a very common disease affecting 65 million people worldwide and 1/3 of those patients actually don't respond to medications. At times, we'll actually will consider surgery as an option for potential cure. So, we sought to use a new method to figure out where the seizures are coming from and to help us direct whether or not we can do surgeries or other therapies to help these patients. Chris - In people with epilepsy, what is actually happening in their brain in the first place to cause the condition? Kate - So, it's thought that there's a mismatch between how much excitation there is and how much inhibition there is when patients have a seizure. The thing we measured in the study measures glutamate which is a neurotransmitter in the brain that is the most common excitatory neurotransmitter. We hypothesised, or thought, that looking for the increased glutamate in the brain could identify even between seizures where the seizures were coming from. Chris - You have a region of the brain which for some reason then seems to have too much activity, owing to this excitatory chemical glutamate. So, you're going to go hunting for where that signal appears to be over represented in the brain to find where the epilepsy might be stemming from. Kate - Exactly. And then if we can identify where that increased excitation is, we can figure out what the brain network is that is causing the seizures. Chris - And then what go in and do some kind of intervention such as a surgical one, but with high precision because you know where the problem is to stop it. Kate - Exactly. We actually frequently do epilepsy surgery for these patients and in fact, sometimes we do very invasive surgeries just to figure out where the seizures are coming from - putting electrodes underneath the skull to further define where the seizure focus is. Chris - So how does it work? How have you done this? Kate - We performed brain images on a special MRI scanner. 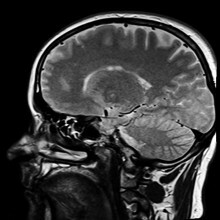 To the patient, this is very similar to a typical MRI. However, we're able to use techniques that shakes certain parts of the glutamate molecule and enable us to make measurements of the glutamate concentration in the brain. We then can identify the increased glutamate regions and see where the patient's seizures are coming from. Chris - How did you prove that where you see an enhanced concentration of glutamate that that was where the epilepsy was coming from in your patients? Kate - These patients are actually all undergoing possible surgical evaluation at our epilepsy centre. So, as part of that evaluation, all of the clinicians and the nuerosurgeons, and radiologists make a consensus statement about where we think the seizures are coming from. In one of the patients, they actually underwent something called intracranial EEG monitoring. In that patient, we showed that the seizures came from the same place as the increased glutamate on our imaging. Chris - How big are the areas concerned? Kate - These are very small areas in the hippocampus which is towards the middle or centre of the brain. Chris - Do you think then that you would be able to do sort of brain sparing surgery in these people, now you know where these very small areas are with high precision and accuracy? Kate - We certainly hope so and are continuing to gather more data and hope to use it for clinical decision making in the near future. Chris - Will it find the source of epilepsy in everybody or is there a chance it could miss some? Kate - It certainly could miss some patients and we simply don't know that yet as this is the first work that we're doing with using this technique. We are continuing to improve upon the technique and have expanded our ability to look at bigger regions of the brain and potentially, help other types of epilepsy patients as well that have seizures arising not just from the middle of the temporal lobe, but in other regions of the brain. It's not just our ears that are important for learning languages, research has shown this week. 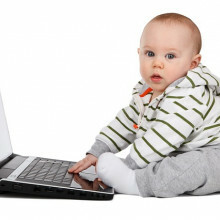 Janet - We brought babies of 6 months of age who were just learning English and we had them sit on their mum's lap while they were listening to sounds and having the opportunity to look at a checkerboard on a computer screen. Babies will look at a display when they hear something that sounds interesting. We had trials were the babies heard the same sound over again: 'ba ba ba' and trials where they heard two different sounds: ' ba da ba da'. And if the babies can hear the difference they look longer at the checkerboard. Now in this case we used two D's that are used in Hindi but not English, one produced by pushing the tongue on the front of the teeth: Da, and one produced by curling the tongue back and flipping the underside on the roof of the mouth: da. Now you as an adult English speaker can’t hear that difference, but it’s obvious to a Hindi adult, and importantly, it’s also obvious to a young English learning infant. Chris - And how does the constraint of the baby’s tongue movements come into the equation? Janet - Once we had ascertained that babies of 6 months could indeed discriminate these two Ds that were used in hindi, then we had 2 further groups of babies. We had the moms hold a flat teether in the baby's mouth, and importantly this teether prevented the baby’s tongue from moving. In the other condition we had the mum hold a dummy teether in the baby’s mouth, but it didn’t project back on the baby’s tongue. Chris - And the rationale here is that if you’ve got something that prevents the tongue moving versus the equivalent oral stimulus - the dummy- which doesn’t prevent the tongue from moving, then they ought to be able to do the discrimination task if it involves moving their tongue around when they’ve got the dummy but when they've got the teether then that should interfere with their ability to do the task if it is important to move their tongue. Janet - That’s correct, that's indeed what turned out. The flat teether interfered with their ability to discriminate the sounds, whereas the dummy was in their mouth they looked longer at the checkerboard when they heard the two different D sounds. Chris - What do you think the implications are of this? How do you interpret these results? Janet - There are two important implications of this results. One, it provides pretty strong evidence that speech perception involves more than just listening in early infancy. It also involves information from the baby’s own motor movements. And the clinical implication is that babies unable to move their tongues, through cleft palate, tongue tie, or perhaps through having ventilators in their mouth, these babies may have a deficit in processing speech and hints in learning their native language. Chris - What about the question, which I'm sure a lot of parents are considering hearing this, whether or not to give your child a dummy? Janet - It’s an open question whether having dummies interferes with speech perception. We think it’s unlikely however, because a dummy is not in a baby’s mouth all the time. They take it out, they move it around, they have ample opportunity to listen to speech and language even when that dummy isn’t in their mouth. Hallucinations could help us to better understand the world around us. Paul - Well, we took some stimuli that are very, very difficult to perceive clearly. They just look like black and white blobs when you first see them, and we asked people to try and identify those stimuli. We then gave them a strong clue by showing them the picture from which those stimuli had been created. When they were back to the original black and white blobby images, they were then able in some cases, to see what those represented. Now we reasoned that if people with hallucinations are more likely to superimpose their prior expectations or their prior knowledge on noisy images or perceptions then they might actually be better at this task. They might show more of an advantage. Connie - What did you find between the two groups? Paul - Well, the key difference was that if you go from before having seen the clear template to after, everybody gets better because they've all been given some prior information that allows them to perceive the image more clearly. But we found that the degree to which there was an improvement was significantly greater in people who are prone to hallucinations. Connie - What we're talking about here is an image. Is it just visual perception or is this with other forms of prior sensory information? Connie - I think it said zoo at the end, but that's about it. Recording - The camels kept in a cage at the zoo. Paul - Now you have that prior experience, we can go back to the original and then it should be much, much clearer because you have that prior knowledge. Connie - That was with the auditory. Could you show me some of the visual images? Paul - Sure. So, I'll show you this image here. Connie - Okay, so it's hard to explain but in the same way that the auditory one was, you could hear it but you can't make it out. It's just a black and white image but it looks like blobs as you explained. Paul - Can you see anything in it? Connie - No. I'm really trying to impose an image on it, but actually, no. I can't see anything at all. Paul - Okay. I'm now going to show you the clear version from which that picture was taken. Connie - It's almost completely clear. So the picture was of a woman with a cowboy hat on kissing the nose of a horse. And then when you go back, you can clearly see the outline of her face, her hat, and the nose of the horse within the black and white image, but there was absolutely no way I could see that before. Paul - Right. So, these images were especially designed for that so that people mostly couldn't pick up very much at all. And then we were able to give the clear image and then test them the second time. Just as you did, a lot of people found that they could now see them. But people who were prone to hallucinations and such like, actually showed a greater advantage there. But what's key here and what we wanted to show is, we can understand the mechanism perhaps by which hallucinations arise through appealing to the normal perceptual mechanism. Rather than just speculating on some gross derangement of function in the brain or some lesion or something, we can actually begin to think about the mechanics of how the experience arises. What we're suggesting is, the hallucination just like normal perception is to an extent a creative process based on what you already know. Connie - It's interesting that perception is an active form and it's not passive. It maybe has been thought. Paul - Yeah. So, a lot of people in the past have speculated on perception as a very accurate picture of the world that we get simply by listening to what's coming in. Actually, what's coming in very ambiguous and it's also very noisy. We can sample the world in terms of heat, light, force, chemical composition. So, we have these signals that are very useful coming in. But somehow, we have to assemble that into our reality. In order to do that, we really need to bring something of what we already know. Otherwise I think we would view the world like babies. It would be a mass of colours and shapes, and noises that we really couldn't understand. Plants have got bees hooked on caffeine, which may make them less efficient at foraging for nectar. Margaret - We found in our study that plants may be tricking their pollinators - in this case, the honeybee - into foraging and recruiting in ways that are benefitting not necessarily the bee but the plant. This particular trickery seems to be happening through the action of caffeine which is a compound that's found in a lot of plants in very high concentrations in the leaves and the seeds, and the stems. It tastes bitter so usually, it has the job of detracting herbivores. But it's also found in low concentrations in nectar. Nectar, unlike leaves is made to be eaten. What we have found is that the presence of caffeine in the nectar of some of these plants can be causing the honeybees to behave as if the nectar is of much better quality than it really is. Charis - These plants seem to be tricking the bees into getting their nectar then. Margaret - Yeah, exactly. So, caffeine is pharmacologically active and it seems to be acting in the reward pathways of the bees. 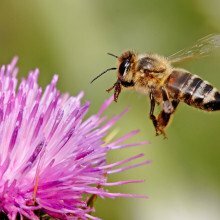 Across the board in all the measures of foraging and recruitment, we see that caffeine has a huge response in making the bees more loyal and more faithful to that particular source. Charis - How did you measure these findings? Margaret - What we did is we trained honeybee foragers to collect from either one of two feeders. They both had a sweet sucrose solution which acts like nectar and they were equally sweet. But one feeder additionally had caffeine in it in a concentration that's normally found in nectar. The bees were trained to one of these two locations and they foraged at it for 3 hours and then we collected data on their foraging behaviour, on their recruitment behaviour that was going on back in the hive, and then starting the next day on some post exposure behavioural effects as well. Charis - What did you find from these methods that you used? Margaret - Compared to the control feeder and remember of course, they are of equal sweetness. Honeybees are very sensitive to sweetness and so, if we see any behavioural differences, it would be because of the caffeine not because of the sweetness. We found that between the two, decaffeinated forage caused the honeybees to forage more. They performed many more waggle dances and they were both more likely to perform a waggle dance, and then they performed more of them, and these are the recruitment events that tell their nest mates that there's something good in the landscape that they need to exploit. And then the next day after the feeders were empty, we saw that the exposure of caffeine had a post exposure effect for many days. So the bees that had foraged on caffeine came back just to check the feeder both more number of times and for more days. This is a behaviour that's called persistency. And then lastly, the bees that had foraged on caffeine were less likely to explore the area nearby. When they would come back to check the feeder, they only would check their feeder whereas the bees that had been trained to the control were more likely to explore the area nearby. So, we saw huge behavioural effects. Charis - Did you find that this affected many of the bees in the colony? Did more bees want to go to the caffeinated nectar? Margaret - Because of the way our experiment was setup, we couldn't actually monitor what's called the recruits. So the bees that were not trained but just got the information that there was something good. Because there was such a big effect on the number of dances, we would predict that there would be more new bees coming from the hive to check out the caffeinated versus the decaffeinated. Charis - What conclusions can we draw from this then? Margaret - It seems that caffeine - this compound that's interestingly found in nectar - it's causing the bees to overestimate the forage quality and makes them forage and recruit in ways as if it were of much better quality than for example the control. Because of this, the colony is perhaps foraging in suboptimal ways. So, it's not exploiting the resources equally even though they are equal energetically. This suggests that maybe the relationship between the pollenator r and the plant is less about cooperative mutualism and more of an exploitation. What would the surface of Mars be like to live on? David - Well because Mars is a planet, so to say what mars is actually like is rather similar to saying, what Earth is actually like because there are many different settings on Mars. But the big difference with the Earth is that there's not much atmosphere. I mean, the pressure exerted by the atmosphere at the surface is less than a hundredth of what you'll experience on the Earth and it's not breathable air anyway. Georgia - Say, you and I have solved the challenges of interplanetary travel, we've just hopped over to mars and we very foolishly stepped out of our spaceship, what would happen? What would kill us first? David - Well, I hope we're not going to step outside the spaceship without wearing a spacesuit, pretty much the same kind of spacesuit as you need to wear in total vacuum because Mars' atmosphere is very, very tenuous. The atmospheric pressure is less than a hundredth for what we got on the Earth. So, even if the air on Mars was breathable, which isn't because it doesn't have oxygen in it, it would not be nearly dense enough to breath. So, you need to protect yourself in a spacesuit. You also need to keep warm. By day, it can be well above zero centigrade - a nice warm 10 degrees or something, but in the winter, it's a lot colder and certainly at night, it gets extremely cold. So, the cold would kill you if you didn't have a way to keep warm. 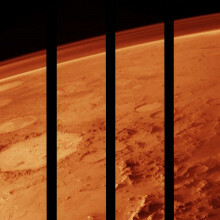 If you're going to stay on Mars a long time, you've got to worry about cosmic rays, solar wind particles. Mars has no magnetic field to deflect these, so you would get a radiation dose by wandering around on the surface of Mars. You would have a worse radiation dose on your journey from or to Mars because you'd be out in space. You wouldn't have a planet hiding half the sky. So radiation is an issue, but not the biggest issue on the surface. Georgia - I guess first things first, we need to set up a base. What kind of things we need to take into account when we're deciding where to put it? David - If we want to survive, we go somewhere that's warm and cosy, and has resources. If you want to go somewhere warm, that's rather incompatible with finding somewhere where there's accessible ice if you want water. So, I guess we can keep ourselves warm with some solar panels to make electricity, so, I'd say go somewhere where we can get a some water. So you go to the polar caps but that's very, very cold. Maybe go to a lower latitude where you think there's some ice a few centimetres or a few metres below the ground, and you can dig for the ice. But the trouble is, if you want to drink that ice, you've got to purify it because it's probably pretty salty and I just don't mean table salt sodium chloride, I mean perchlorate. They're quite nasty alkaline salt. So, you've got to be prepared to purify it. Georgia - You mentioned using solar power. Is this the most feasible way to generate energy while you're on Mars? David - It's almost never cloudy on mars. Sometimes there's a dust storm which blocks out the sun, but by day, you've got clear skies. The intensity of the sunlight, because you are further from the sun is a half or less than what it is on the Earth but that's plenty! Solar panels can generate lots of electricity for you. I mean, there's no point setting up a windmill. I mean, the winds do blow and they blow quite fast, but the atmosphere is so tenuous. There's not much power in that. So, forget wind power, solar power is the way to generate energy on Mars. Georgia - What about oxygen? You mentioned the atmosphere is pretty rubbish really for breathing. Would we have to take all of our own? David - Well, the atmosphere is mostly carbon dioxide and carbon dioxide is 2/3 oxygen. So, you can with the use of electricity split that apart and get some oxygen out of it. Or you can get oxygen from water. There is oxygen in the rocks! The rocks are silicates which is silicon dioxide and various metals. In fact, the Martian surface rocks are extremely oxidised - Mars is rust - that's why it looks so red. Now, that's oxygen that's there but if you can use a bit of electricity or any kind of power or chemical process to get that oxygen out of the rocks and get oxygen atoms to bond together to form O2, the oxygen molecule then you've got something you can breathe. So there's plenty there. It will cost you effort to get at it though and turn it into breathable form. Georgia - Now thinking long term, how would we provide ourselves with food? Could you ever grow food on Mars? David - I think you would be taking quite a gamble if you were the first person to arrive on Mars and were relying growing your food because plants require all kinds of trace elements which may or may not be there in the soil. The stuff at the surface of Mars isn't really a soil as we know on Earth. Of course, there's no organic content, or very little organic content and it's mostly very fine grained, very oxidizing fragments. But plants have been grown in Martian regulated simulants on Earth. So, there's a fair chance you can grow things on Mars. We're not sure how they'd cope with the weaker gravity - the Martian gravity is 1/3 what it is on the Earth. That's probably strong enough to give plants a good sense of what's up and what's down, which they need. There's enough sunlight. If you've got water from the ground or from melting ice, it's certainly viable to grow plants on Mars. Georgia - Just a bit tricky. David - Just a bit tricky. Probably, more than a bit tricky but it's a problem that somebody will overcome one day. What would day-to-day life actually be like in a Mars settlement? Ashley - So yeah, I was part of an astronauts on mars simulation study in collaboration with NASA, the European Space Agency, and about two dozen other entities. 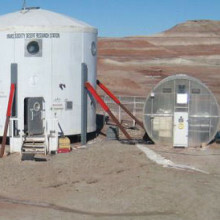 This study was conducted at the Mars Desert Research Station in the high altitude desert of Utah, a place chosen for its likeness to mars. I was actually the crew commander in a team of 7 scientists and engineers. Whilst being subjected to psychological and protocol studies, we conducted a wide range of experiments, all very relevant to pushing forward to the frontier in an effort to get people to mars. Kat - Was it really an accurate reflection of what life would be like on mars? Did you have any contact with the outside world? How did it work? Ashley - We tried to make it as accurate as possible. We really were isolated. Communications between us and mission support were delayed by between 3 and 21 minutes, depending on where Earth and mars are in their orbits. There's quite a significant time lag. So, we really had to be independent. Whenever we stepped outside to do field work, we had to get a spacesuit on. We were outside for limited periods of time with the limited oxygen supply we had. We took it as far as we could really, even the food we were eating was the kind of stuff you'd eat on mars - dehydrated powder, nothing more than that really. You don't realise how much you missed chewing food. Kat - Having done these programmes for three weeks, I am not cut out to go and be a Martian. Tell me again. How long were you there for? Ashley - So, it was a two-week simulation. We conducted probably about two dozen experiments. everything from psychological studies to astrobiology work, rover testing, protocol testing, a whole range of things. Kat - Did you have to cope with any emergencies? Were there any sort of simulations of things you might have to repair or unexpected situations to deal with? Ashley - Yeah. This is the thing. Those people on mars, because of that time lag, need to be a lot more independent. So, if something goes wrong, they don't have mission support to immediately lean on. They need to figure out their own way out of a problem. Now, what if you're out doing field work and your radio stops working? What if somebody out doing fieldwork sprains their ankle? How do you even pick up somebody that's injured in a spacesuit in a safe way? How do you get them back to the habitat module? What if something more subtle has occurred to somebody and nobody really knows what to do? How do you communicate with mission support in the most efficient way to resolve that issue? There are thousands of questions like these that need to be addressed now before we go. That was one major aspect of what we were doing. Kat - When we did the first in this series, we looked at the sort of the, what does it take to be an astronaut and the psychological side of it. I have to say, how was it being in that situation with people because I personally, I would be ready to kill if I was stuck in a small thing with the same people for two weeks? Ashley - Well, that's the thing. Personal space is something you completely lose, if you're not within eye shot of someone, you're definitely within ear shot. The thing is, you're always in each other's faces and if there's any disagreements, any arguments, the option to walk away is simply not there. You can't just step outside. You need to be able to diffuse these sorts of situations before they happen. For a mars mission, the one trait more than any for an astronaut to have is they have to have a cool head. They need to be slow to anger. In my opinion, psychology really is the single biggest risk factor when it comes to sending people to mars. We can't predict how people are going to behave in such a prolonged and intense environment. Almost every system around you is mission critical. If it fails, you die. How do people react to that over the long term? Kat - In terms of an actual Martian mission, how much of it would be experiments, how much of it would be - would it actually be quite humdrum do you think? Did you get that feeling over the two weeks of the simulation? Ashley - Well, in reality, you're on a trip to and from mars and one way, it's about 6 months and most of that is going to be automated. So, you really are going to be sitting there twiddling your thumbs. How do you overcome that boredom? I am not quite sure. Read books, watch movies, who knows? Kat - Having done that simulation, do you think you would actually go to mars if the opportunity came up? Would you go like, "Yeah, I'm going to sign up. I'm going to sign on the line."? Ashley - Personally, sure. But the senior management, my wife, I don't think she'd allow that to happen. Kat - In terms of more generally the kind of simulations that are going on around the world at the moment, do you think that they are really going to equip people to do this? I guess there's going to be things when we get up there, we just don't know what's going to happen. Ashley - Yeah. Well, we're doing the best we can. There are more subtle things that we're just not going to be able to figure out until we go there. As mentioned before, the lower gravity, what sort of effect is that going to have on the human body? 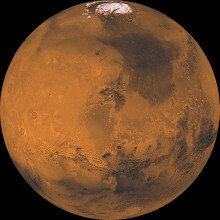 Mars has a gravity that's 38 per cent that of the Earth's. Now, we've has astronauts in the International Space Station doing long term studies on what microgravity does to them, but we don't know what 38 per cent gravity does to the human body. There's no real way of figuring that out until we go there. How would Martian settlers diagnose illnesses without the luxury of hospital equipment? Mark - The Diagnostics Development Unit is a unit which attempts to do non-invasive diagnosis of disease ultimately. We're doing that through three different methodologies, going back to what ancient medicine did in terms of looking at a patient, smelling a patient, and feeling the pulse of a patient. Georgia - It smells people, it looks at people. Why is this better than the traditional way of diagnosing illnesses? Mark - The idea of this is that some tests take hours for the results to come back and you get some information without sticking needles in them, with the complications of infection and stuff like that which aids the clinician in terms of actually doing their work, treating the patient earlier, perhaps ruling out some things, and ultimately, perhaps even diagnosing given conditions. But before we get there, we need to know what a normal human being is and what signals or data you would associate with this each of the different types of measurement for a different condition. The hope is once we know what a normal patient looks like and we know what some of these conditions are like, we can come up with a real firm probability, it's X, Y, Z. We're a few years away from that. At the moment, we're analysing the individual data and we're going to need some help from some mathematicians and artificial intelligence experts in order to put this together and actually get it to work. And become something which ultimately, won't just be in hospitals perhaps in the GP surgery. Perhaps even in a chemist, perhaps even at home ultimately if you get the price of these gadgets down low enough. Georgia - Can I see some of this in action? Mark - Certainly can, yes. Georgia - The DDU is based deep in the hospital where it's been operational for a few years gathering data. It's basically a small cupboard chockfull of expensive looking scanners and monitors designed to look, smell, and feel their patients. Lisa - I'm Lisa McLelland, the research nurse for the DDU. You're looking at the mass spectrometer which does the smells bit like a sniff of a dog. The compounds that it's actually been picking up is, it has a tendency to be able to pick up cancer and sepsises, infections throughout your breath, just through the molecules that travel around through these two pieces of equipment, breathing in and out pipes, travel all the way back around the machine, and back into the computer. Georgia - Once you've been smelled to check you're all shipshape, the machine needs to take a look at you. So next stop in the DDU's medical arsenal, we've got the thermal imager. Lisa - Mark, if you want to put your hand on the wall. So, with the camera. Georgia - Wow! Okay. We're looking on the back of the camera. 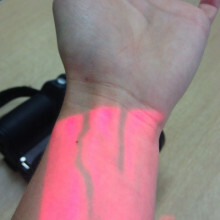 There's a screen and you can see this glowing orange handprint. Mark - You can actually see the temperature difference from my hand on the wall when I remove it. So, that small change in temperature is enough to actually be picked up by modern technology and it's also great in terms of the spatial resolution as well so you can tell fine structure in the skin. You can look at whether people are undergoing shutdown i.e. the blood is retreating into the core. As it does, that's when the classic symptoms are going from fever into the so-called state of sepsis which is severe infection. Georgia - So, you smell good, you look healthy, the machine still needs to have a good feel. Mark - Just behind is the bioimpedance thoracic monitor. That actually came out of the space programme. It's developed in the 1960s for the Apollo astronauts to try and come up with a method of actually seeing how well their hearts were beating without lots of sensors. Essentially, what it does is it measures the electrical resistance in your body and that changes as the blood flows around your system basically. By looking at the change in resistance, you can tell how well the heart is beating, et cetera. Georgia - It seems like some of this kit has already proven its use in space. So, is this what the first Martians should consider taking with them? Mark - Part of the problem which nobody has really solved or cracked is that if you have a long expedition to mars or wherever in the Solar System, how do you keep your astronauts healthy. What would you if they're non-healthy? The great problem is how do you treat them medically. The nearest hospital might be 100 million miles away or 150 million miles away depending on where you are in the orbit. Astronauts tend to be very, very healthy people. Scott Kelley for example is on the International Space Station. He'll be up there for a year. So a year is probably not an issue, but if you're talking of sending people to mars to form a colony on the surface then who knows. Georgia - What kind of things - do people get colds in space? What kind of things do you imagine astronauts will be having to deal with? Mark - I mean, people get colds in space. The body fluid distribution changes, their heart pump and action changes. It looks like viruses and bacteria become more virulent in space for reasons we don't understand. So, certainly infection is a potential problem. On another planet, it might be broken bones. You might even need surgery. People develop conditions which you have to operate on. Otherwise, the only alternative is perhaps a painful death. Georgia - Are there plans to miniaturise some of this equipment and maybe contain it all in one piece? Mark - Essentially, yes. The hope is that by studying these patients, you can narrow what you need to look at down. We already know some of the technologies to miniaturise some of those pieces of equipment. The question with miniaturisation is, will it ever be sensitive enough to replace these quite expensive research great pieces of equipment? Georgia - I guess if you're going to mars, beggars can't be choosers. They don't have a lot of room to work with. Mark - That's correct. In the spacecraft, you want minimum mass, minimum volume, minimum power. What do you take on a mission to mars? Do you take an x-ray machine, an ultrasound machine, you take some of this equipment or what? Over the next few years, hopefully, that will be sorted out before we send astronauts to the red planet. 39:05 - Could we grow rocket fuel on Mars? Could synthetic biology allow colonists to grow their own food, oxygen or even rocket fuel using bacteria? Could we grow rocket fuel on Mars? Lynn - There are all sorts of fancy definitions but the easiest way to look at it is that we're able to do something new with biology. So, whereas we don't hear as well as a bat or run as fast as a tiger or whatever, if we could have those capabilities, if we can mix and match the genes, we could do all sorts of wonderful things. And the same would be true of a bacterium or an alga or a plant or whatever that you can give it new capabilities that it never had before or perhaps no other organism on Earth ever has had. Kat - So say, you want some bacteria to make rocket fuel. You could do that? Lynn - Absolutely. I mean it depends what you're running your rocket on but certainly, organisms make fuel. In fact, every time you turn on your car, you're burning products from organisms. They happened to have been dinosaurs. But there's no reason that you couldn't use organisms to make fuel on Mars. Kat - How does this actually work? Say, we're going to Mars and we want to have this manipulated bacteria there, what do you need? Lynn - We need some sort of infrastructure just like you have in the lab and I think the best way to imagine it is if you've ever been through a distillery or a beer production facility. You have vats where you have microbes in the case of beer for example, there are yeast cells that are metabolising some kind of input whether it's grass or whatever. 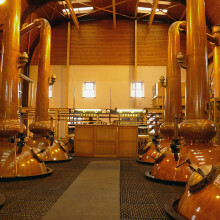 And then they're producing alcohol. Instead of grass, we would be using other sorts of photosynthetic organisms. Probably, some sort of a microbe like a cyanobacterium. If you're very old like I am, we used to call them blue green algae. For your production organism, we might be using a yeast cell, as you say, we might be using a bacterium and then you're able to produce honestly, anything from a leather simulant to food, to perfume, to clothing, to rocket fuel. I really believe that we could make just about anything you need using biology. Kat - In terms of the actual DNA stuff, how would you take that? Lynn - Well, it's easy because if you're taking a human, you're taking lots of DNA. In fact, not one of the spacecraft we have ever sent anywhere has been completely sterilised. So, we've already sent DNA all over the Solar System and beyond. In terms of bringing up small quantities, we could certainly do that in cells. We're working right now with a particular bacterium, Bacillus subtilis, that forms a very resistant spore. These spores have been flown out on space on satellites for over 2 years so we know they're highly resistant so we could send the DNA in a spore form, we could dry it and send it. But ultimately, we won't even want to do that. We're going to want to break this physical link. And so, what we'll want to do is on the Earth, send information to how to make new DNA and the colonists on Mars will take that information and actually print new sequences of DNA. Kat - From my understanding of synthetic biology, it's a lot about having kind of standard components and parts, almost like a library that you could just pick and choose. What kinds of properties could potentially be put into bacteria that we could take to Mars? Lynn - There's a very, very active community working on this on planet Earth for Earth-based applications. So, people are already involved in all the sorts of things that I mentioned - from perfumes and fuels to certainly, antimalarial drugs, other sorts of drugs. But the real conceit of all this is that when you take up for example a computer, you're lifting up a lot of mass into space and your computer goes bad, what do you do? You can't really call for another one to be delivered the next day. And so, you're going to have to deal with what you have and biology as a technology has incredibly appealing properties. The big one is that it replicates itself. I mean, if you had computers that replicated themselves, no big deal or your clothing, you put down your trousers in the evening and there are two in the morning that would be great. But that's not the way physical things work, but that's the way biology works. Furthermore, if it's damaged, it can repair itself. And so, when you start to think of biology as a technology, it opens up all sorts of possibilities. Kat - Would there be risks then of releasing these manipulated bacteria on Mars? Lynn - The biggest problem with sending things to mars is that there is a possibility that there is an indigenous Martian biota. Honestly, that would be the biggest scientific discovery in the history of biology if we found a second life form, and particularly, if it was in the next planet over. So, if we send astronauts and all these organisms and so on, and we destroyed our possibility of finding the second life form, that would be an enormous scientific tragedy. How would society function on a small, dangerous planet over 30 million miles away from Earth? 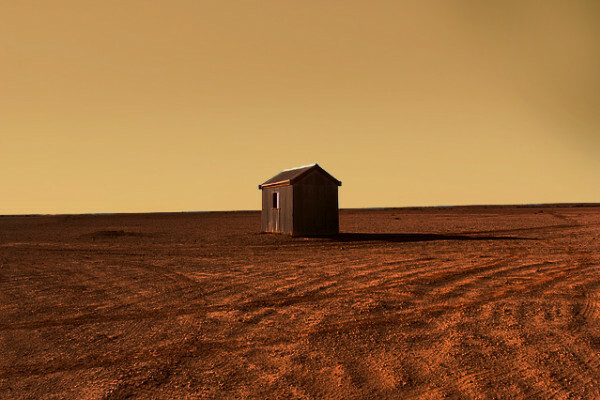 While it's clear that the technical challenges are enormous, if we ever did manage to set up a one way trip to Mars, how would the first settlers function as a society? What kind of laws would exist, if any, to start with? And what would happen to the first child born in Mars? These are questions being considered by astrobiologists and ethicists, including Tony Milligan, from Kings College London, who explained to Georgia Mills what could happen if we're not careful. Tony - If it's a very small group of people, they're just to inherit the initial manned structures of programmes to get to Mars. So we had Ashely speaking about being crew commander of a group of seven people but if you begin to introduce larger numbers of people - something like more like a stable human community with the prospect of staying there and rearing children and so on - it's not obvious that you can scale up that authority structure so that it works. There is a danger here and the danger is that in some respects, the political structures that Mars guides you towards are not necessarily going to be stable ones. And what I mean by that is that it's an exceptionally dangerous environment. A great many things can kill you. The settlers would be immensely vulnerable, a situation in which anyone who controls say, the oxygen supply or who was in control of the water supply would be effectively in a position to establish some form of political dominance. And that's a dangerous thing because we know that authoritarian systems create their own culture of descent as it were. Under accepting the vulnerable circumstances of Mars, we couldn't afford to have the kinds of violent descent that we have down here on Earth. Georgia - I see. So, a rebellion would probably just end up wiping everyone out who was there in the first place. Tony - Yeah, we all die in a rebellion. Georgia - Not ideal then. So, if mars lends itself to a dictatorship like this, do you foresee that democracy is feasible? Tony - Yes, I do strangely enough. The reason for that is that dictatorships are precisely for generally descent. So, I think in the long run, the most stable structures would be those which allowed people to feel included and which allowed people to feel that their arguments, their problems were tackled. However, not a democracy of a sort that would look anything like terrestrial democracy that would have to be significant differences. Georgia - This is going to be - excuse the pun - so alien from anything we have here on Earth. How do we go about setting up these new rules? How do we do it? Tony - How do we do it? Gosh! You can approach this from two directions. One is advanced planning. You draw something like a road map to transition from initial command structures to a more democratic structure and that's kind of the ideal. And the second option is you rely upon the settlers themselves. At some point in time, they're going to turn around and say, looks the Earth is exceptionally remote. We don't have to do what the Earth tells us anymore. And that's a little bit more dangerous but that's also a foreseeable pathways as it were to specifically Martian political system. Georgia - I'm thinking now of the settlers from Europe going over to America and then America declaring its independence. Could we have a Martian independence day? Tony - Yeah. I think we could, but we can't all, as if were, dance like it's 1776, we can't have that large scale militarised upheaval because again, everyone dies in a military conflict. Georgia - If you blow up the tea on Mars, everyone dies. Tony - If the tea goes then everyone goes with it, yeah. Georgia - Now thinking long term, if these colonies do succeed and someone gets born on mars, I guess they would technically be a Martian? Tony - Yes, yes, and they're going to have certain problems because, whereas it may be the case that the initial settlers could come back to Earth if things go badly, for those born in Mars, it's extremely unlikely that their physiology could cope with a return to Earth. Their bone density wouldn't be right for it. So, we have to get this right. If we're going ahead with this process and if we are bringing people into being under circumstances which is not of their own choosing, then we have to ensure that there is the possibility of a good life for them. Georgia - This is quite sad being born on mars, seeing Earth and all the fun we're having and they're not being able to come back. Tony - Yeah. Being just on the edge of the carnival and you can't go in. 49:50 - Are zombies feasible? Rosalind - Zombies are most commonly known as reawoken human corpses with a hankering for brains and have long been centre stage of both films and nightmares alike. 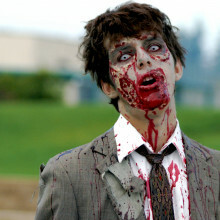 While the dead are unlikely to rise anytime soon, could anything make the living behave like zombies? There's been a mixed response on Facebook with Rachel saying, "I hope not. I'd be the first to go." And Dante speculating that The Pentagon has a panic room as a precaution in case of a zombie outbreak. This was all getting out of hand so I recruited two experts to help this week to look at both viral and parasitic possible causes. Dr Suzie English from the Department of Pathology at Cambridge University explains the main viral threat. Suzie - Classic fictional zombies infect their victims through bites. This may be inspired by real life group or genus of viruses called lyssaviruses, commonly known for causing rabies. Once bitten, rabies infects the central nervous system. Symptoms include confusion, aggression, and the characteristic fear of water. Rabies is associated with a very large concentration of virus in saliva, leading to a high risk of transmission from bites, licks, and scratches. It has 100 per cent mortality rate once symptoms begin which is why there's been immense fear of rabies across time and cultures. Rosalind - So, it's plausible in a viral sense, but what about zombies caused by parasites? Khalil Thirlaway is an immunology PhD student from Nottingham University. Khalil - There are already lots of parasites that are experts at taking control of their hosts. Take the zombie ant fungus for example, ophiocordyceps. An ant comes into contact with fungal spores which germinate and grow through the ant's exoskeleton. Through mechanisms that we don't yet fully understand, the fungus takes control of the host and forces it to climb up a plant stem and clamp on to a leaf stalk. Having locked the ant's jaws shut, the parasite grows throughout the host's body producing antimicrobial chemicals to stop the body rotting. When the fungus has totally consumed the ant's insides, the fruiting body bursts out of the ant's head and spreads the next generation of spores, ready to infect more unsuspecting ants. Rosalind - Terrifying stuff. But say, a virus or a parasite like this did exist, could it really wipe us out? Suzie - Well researchers have looked at Hollywood depictions of zombie apocalypses to model pandemics of new emerging viruses. One 2009 study made headlines by explicitly using a light-hearted approach to play out various scenarios including whether or not to quarantine infected human hosts who have not yet turned into zombies. According to their research, a zombie outbreak could lead to the collapse of civilisation as we know it. Rosalind - Is it feasible that a zombie-like disease could emerge in the first place? Suzie - No, it's not likely. There's no currently known virus that produces zombie-like qualities. Khalil - It might however be possible to engineer such a disease using the new discipline of synthetic biology. Rosalind - I hope that allays your fears Stephen. Zombies are probably going to stay science fiction although I think I'll try and get a pass to the Pentagon's panic room just in case. Thanks to Suzie English and Khalil Thirlaway for those answers. Next week, we'll be scanning the horizons to answer Eleanor's question. Eleanor - Why do so many people enjoy looking at views? Georgia - Any psychologists out there who can help, you can email chris@thenakedscientists.com, find us on Facebook, or tweet @nakedscientists or you can join in the debate on the forum that's thenakedscientists.com/forum.